Multiplication is the absolute milestone in mathematics because it allows you to count very quickly. You'll notice there are many pages dedicated to multiplication on my blog and website here at the house of math. That's because multiplication is tremendously important. 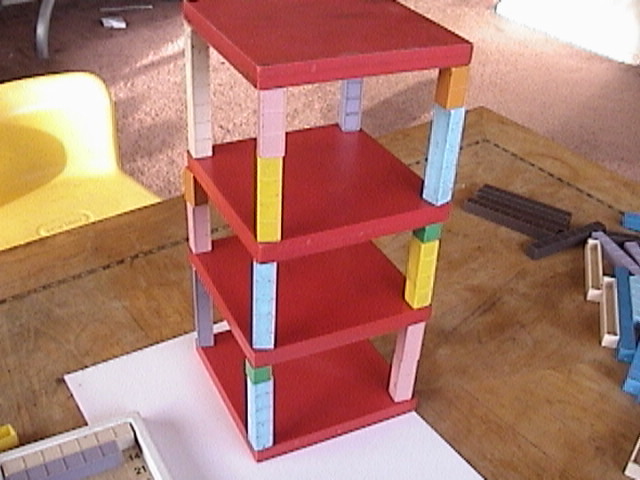 Games and Activities make multiplication fun, In addition to learning their addends they can learn the first four multiples of numbers just by building that tower. On the bottom level we can count 6, 12, 18, 24, in addition to learning that a six can be 6 + 0, 5 + 1, 4 + 2, or 3 + 3...patterning is the first step to learning Multiplication. Playing and building make it fun. The earlier you teach multiplication, the easier it is. Using worksheets is probably the worst way to teach Multiplication, followed closely by flashcards. Both of these resources have their place, but they should be used last, not first. Singing songs when they're very young is a great place to start. Skip counting and building with blocks and then counting them is much more effective. You can search YouTube for Multiplication music videos, & the Mortensen Company sells a skip count CD with coloring books to help you get started. I am partial to Multiplication Rock myself. AFTER You've spent quite a while playing with blocks and singing songs, then you can use worksheets and flashcards, Not only to help with repetition but to gauge how well Students have mastered their multiplication tables. The matrix should be memorized out two 20 x 20. Once you get addends & the 9 x 9 matrix memorized, the rest should come easy. & see how much stuff comes back. Round out your homeschool math curriculum with The Series A Manuals. Here is a sneak peek at the Multiplication manual. There are nine other manuals in the series. The Series A Page has all the manuals, videos, and PDFs plus links to a whole lot more. It's not free but it's worth it. Some of these require Passwords.